In the land of Aracardia where giant beasts dwell, one titanic creature towers over them all. This creature is the mightiest Dragon in the realm, slow to anger but terrible if provoked. He is Vargas, the Stone Tyrant. 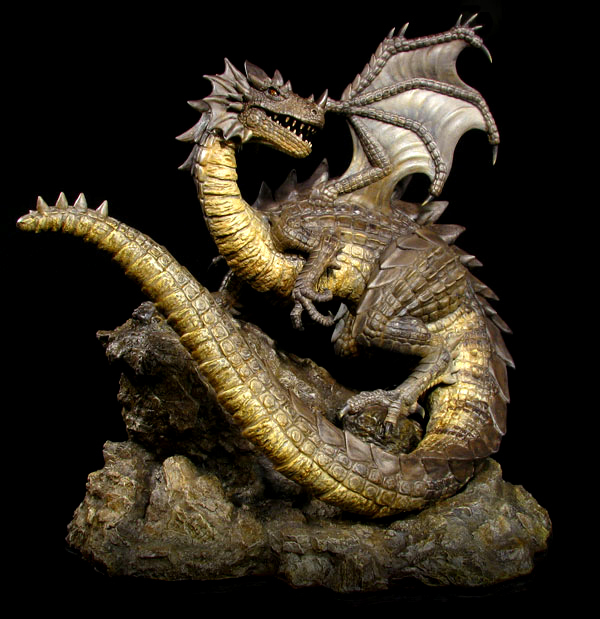 This Dragon makes his lair deep within the earth in the world's largest cavern, Titan's Cave - which also happens to be carved out of the world's largest mountain, Titan's Peak. This remote mountain lies at the very heart of Aracardia in the Thornrock Mountains, and deep within it this Dragon is guardian of a marvelous formation of dark crystals that house the slumbering spirit of the Earth Goddess TERA. Vargas is known and feared for his ability to shake the earth for miles around him with his ferocious roar, and his terrible gaze turns those he looks upon in anger to stone! It is said that this Dragon shares a symbiotic link with the Goddess that sleeps within the great crystal, and that what he sees before him, she sees in her endless dreams. Woe be upon any who seek to take from the land without returning in kind - those who would threaten the sanctity of these mountains for their own gain are dealt with swiftly and mercilessly. "Vargas the Stone Tyrant" stands 18" tall, with a base diameter of 17" across. From nose to tail, the Dragon measures 50" long. The power of the element of Earth shines in his bronzite eyes.